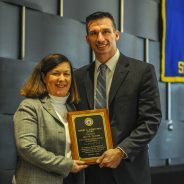 Saratoga County District Attorney Karen A. Heggen is pleased to announce that Saratoga County First Assistant District Attorney Alan Poremba was recognized by the District Attorney’s Association of New York (DAASNY) as a recipient of the 2018 Morgenthau Award at the Association’s annual Winter Conference in New York City. The award is named after legendary Manhattan District Attorney Robert Morgenthau and is awarded to assistant district attorneys who exemplify Morgenthau’s high standard of honesty, integrity and commitment to justice. Poremba is one of only four assistant district attorneys from across the state to have been tapped this year for this distinctive honor. “Alan Poremba epitomizes the characteristics of the former New York District Attorney Robert Morgenthau, for whom the awarded is named. He is a dedicated, committed prosecutor who works tirelessly each day to insure that justice is achieved for all involved in the criminal justice system in Saratoga County” said DA Heggen. In nominating Poremba for this award, Heggen highlighted several cases Mr. Poremba has handled since joining the Saratoga County District Attorney’s Office in 2004, including an almost 40 year old missing person cold case that ultimately resulted in the prosecution and conviction of Nelson Costello who killed then 22 year old David Bacon. DA Heggen said “Al worked tirelessly with members of the New York State Police to piece together the events from those many past years, uncovering witnesses in far regions in the country, and ultimately securing a conviction for manslaughter that resulted in a significant prison sentence”. Additionally, Heggen noted that “Mr. Poremba’s work last year in securing Burglary convictions in two separate home invasion cases in Saratoga Springs brought to justice a defendant dubbed by the press as the “Sleeper Creeper”. ADA Poremba proved at trial that the defendant broke into people’s homes and was present in their bedrooms as they slept. That jury verdict of guilty resulted in the defendant receiving the maximum sentence and removed a dangerous predator from our community”. Alan has been a prosecutor for 19 years, the last 14 years in Saratoga County. He started his career in the Albany County District Attorney’s Office in 1999 when he was hired by then District Attorney Sol Greenberg. He worked as a felony Narcotics and Gun Prosecutor in Albany for 5 years. He joined the office of Saratoga County District Attorney James A. Murphy, III in October 2004 as a Narcotics prosecutor. He was subsequently appointed Bureau Chief of the Narcotics Unit and last year was named by DA Heggen as Saratoga County First Assistant District Attorney. Al makes his home in Saratoga County with his wife and two children.